* This post is not meant as condemnation to you. I do want to take a moment and mention that there are seasons in our lives. New babies. Times of overtime at work. Sick children. These are all times that your husband will likely not give or get much time. If you are in such a season, feel free to skip this post. As a stay-at-home, homeschooling Mom, I spend A LOT of time with my kids. I wouldn’t change that for the world. But I often feel exhausted by the end of the day. Even if you aren’t a stay-at-home mom and you don’t homeschool, it’s easy to let everyday life get in the way of the marriage relationship. Life just gets so busy, that our husbands often get the leftovers. At times, there aren’t even really any leftovers. Yet, we married our husbands because we love them. We wanted to be together for the rest of our lives, so it hardly seems fair that our husbands always get the leftovers. Long after my kids are grown and gone, I want to have a relationship with my best friend. Here’s the thing, relationships don’t work without effort. Relationships take time. If we don’t put effort into our relationships while our kids are young, we probably aren’t going to have much of a relationship at the end of it all. So how do can we show our husbands that we value them on a day to day basis? I’m so glad you asked. 1) Send him an “I love you”, “I value you,” “I think you’re hot” text in the middle of the work day. -This is an awesome way to remind him that you do think about him throughout the day. I do this one often. 2) Greet him with a hug and kiss when he gets home. -I don’t do this one perfectly all the time, but it’s one my husband really appreciates. 3) Take a minute to check your hair, do your makeup, change your shirt, put on perfume, etc. before he comes home. -I don’t think you have to do all of these every, single day. I don’t always wear makeup when I’m home, but I try to look presentable when my husband comes home from work. 4) Write Him a Little Love Note. -Every once in awhile, I write my husband a short love note and leave it somewhere for him to find. I usually include something that I appreciate about him. 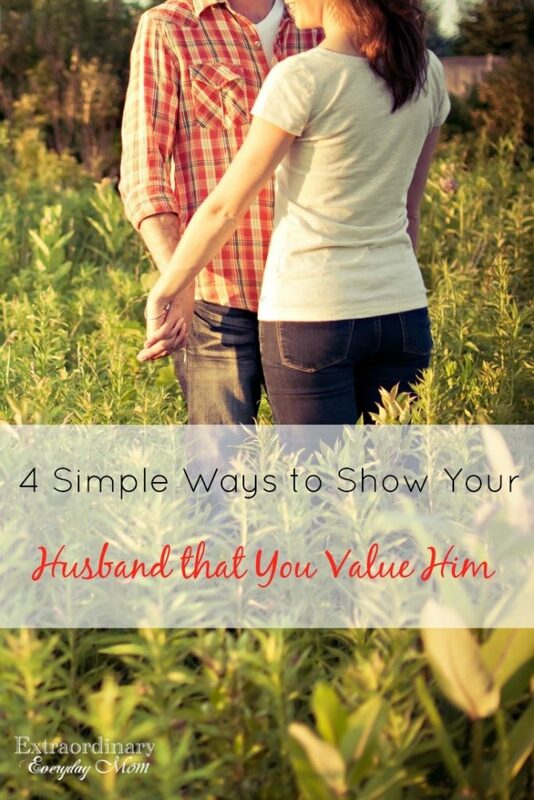 Those are 4 of the ways that I show my husband that I value him on a day-to-day basis. 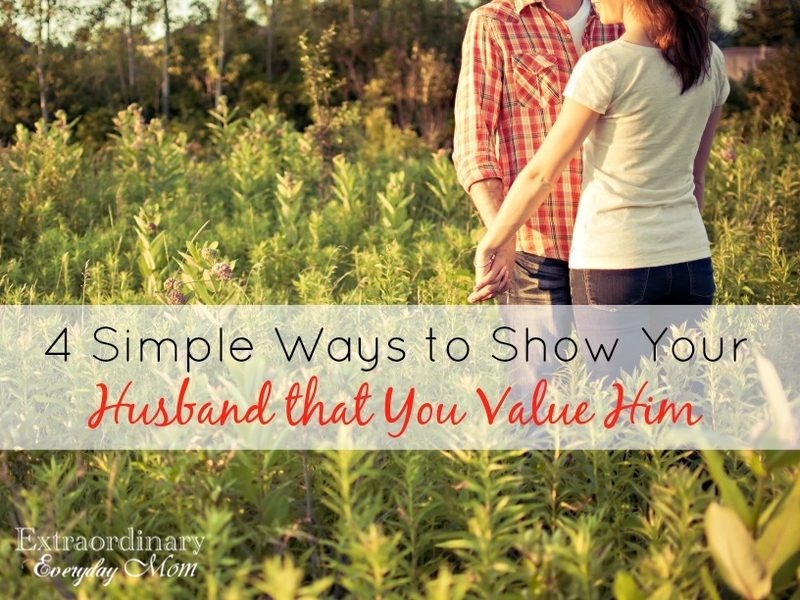 How do you show your husband that you value him? Please take a moment to share with me in the comments. These are such sweet thoughts and reminders. I’m at the other end of that season – our kids have just left home and we’re adjusting to it being just the two of us again. Great post! I can only imagine that season, Michelle. I’m not sure what we’d do with it. Blessings on re-discovering your love together again! Thanks for this encouragement, Rosanna! I do love to send my husband text messages when he’s at work, and we’re still newlyweds with no children yet. I want to definitely remember to continue to do that even once we’re parents. It’s definitely important to remember this after having children. I remember thinking it would be easy, but it definitely isn’t. The important thing, for sure, has been to try to be intentional. You will mess up, but when we recognize that we’ve messed up, we pick ourselves up and start again. So important!